Bandicam provides FPS management, video-recording and Image-capturing of games and streaming videos, which are functions similar to some other software, but with higher quality closer to the original work. Bandicam consists of 2 modes. One is 'Game Recording' mode, which can be used to record the target created in DirectX (or OpenGL), and the other is 'Screen Recording' mode, which can be used for recording a certain area of the PC screen. Bandicam is very easy to use, if you have any problem in using this program, you can check their user manual which explains it to you step by step. Bandicam supports various video codecs (MPEG-1, Motion JPEG, Xvid, YV12, and RGB24) and audio codecs (MPEG-1 L2 and PCM) and image format (BMP, PNG and JPEG). 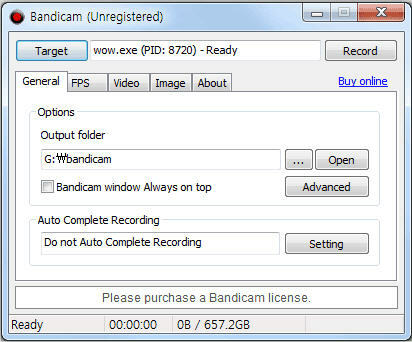 With Bandicam, you can record various 2D/3D games like WOW, MapleStory, Second Life, RuneScape or Streaming video playing programs and it won’t slow down or affect your game or video. The size and the quality of the recorded files are big pride of Bandicam. Bandicam provides performance far superior to other similar programs and with a high compression ratio. If a CPU of CORE2 DUO grade or higher is used, the capturing of the 1080P full HD grade streaming video can be handled. The size of the recorded files is comparatively small. Another advantage of Bandicam is that it minimizes CPU usage during the conversion of the streaming video, so it will allow streaming video to be captured with a low-performance computer. Besides, the BandiFix program that is included in Bandicam can recover corrupted files (*.avi) which caused by unexpected problems during recording. 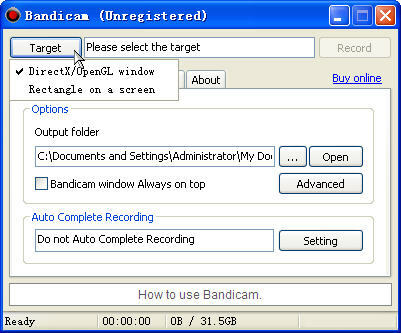 The shareware version of Bandicam has full function as the registered version but the watermark will be shown on the recorded video and the recording time will be limited to 10 minutes. By virtue of its powerful functions and high-performance in recording games, Bandicam has won many customers like Dungeon & fighter, Bubble Fighter, etc.